Reliable casting solution for Macs only. 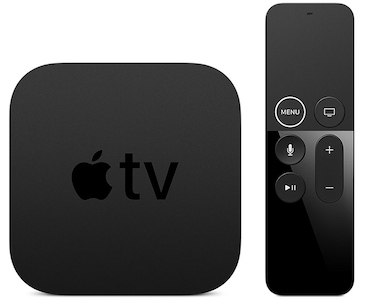 The Apple TV 4K is a small set-top box. It is powered by a normal power cable (included), comes with a touch remote and connects to your screen through HDMI (cable not included). As the name implies, it also supports 4K displays at their native resolution. It also includes an Ethernet port (and WiFi) to connect to a network. Setup can be done through an App or standalone. For reliability you can choose to use the Ethernet port to hook the Apple TV up to your network, it can also connect to your WiFi (entering your WiFi password is very easy, you can just dictate it while holding the microphone button on the remote). This article describes all the necessary steps in the setup process. You can mirror any Mac computer's screen through AirPlay, easily enabled through the Display Settings in the Settings panel of your computer. You can also mirror any iOS device (iPhone, iPad), but results might be mixed because the mobile Safari browser does not allow full screen mode for Walls.io. Mirroring Windows PCs is not available without the use of paid third party apps and not recommended for this device. The same goes for Android devices. Pros: picture quality is excellent, animations display smoothly. If you want to mirror a Mac computer's screen but can not connect the Mac to your display directly, that would be the best solution. Cons: not available for Windows/Android.